Ahh, it is Wednesday but even better...I slept wonderfully last night. For as long as I can remember I have had a restless leg problem which usually bothers me in the evening but does not interrupt my sleep. Sunday and Monday night's sleeps were fairly miserable as I could not get the restless feeling to go away - iPod, meditation and willing it away didn't work so both days I woke up bleary eyed. Strange how our bodies work. A few quiet weekends left before Club Soccer ramps back up here in So Cal and I am really looking forward to it. My older son is playing Volleyball in high school and that also begins in a few weeks and can't wait to see him play. I was so lucky when I was in high school as my father (who worked at home) came to every high school soccer game I played in no matter where the location. He would always be the lone person in the visitor's section whenever we played at locations which were far from our home. Twenty plus years later, my father attends every high school Basketball game that my younger brother coaches. In fact, I am taking him tonight to my brother's last game of the season. It will be a bit sad for both my brother and I as this may be the last game my father goes to watch. Gardening: I have tomato and eggplant seedlings coming up and just transplanted them to bigger containers yesterday. I harvested Cauliflower from my garden plot the other day and have Spinach, Red Cabbage, Yellow and Red Onions, Garlic and Shallots and Kale growing nicely right now. Can't wait for the Kale to get bigger so I can begin harvesting as I love Kale! One of the rules at my garden plot is that we may not plant Tomatoes/Peppers/Eggplant before March 1st so I play by the rules and planted an Early Girl tomato in my backyard yesterday. 50 days from now I should be munching on my first homegrown tomato of 2011. 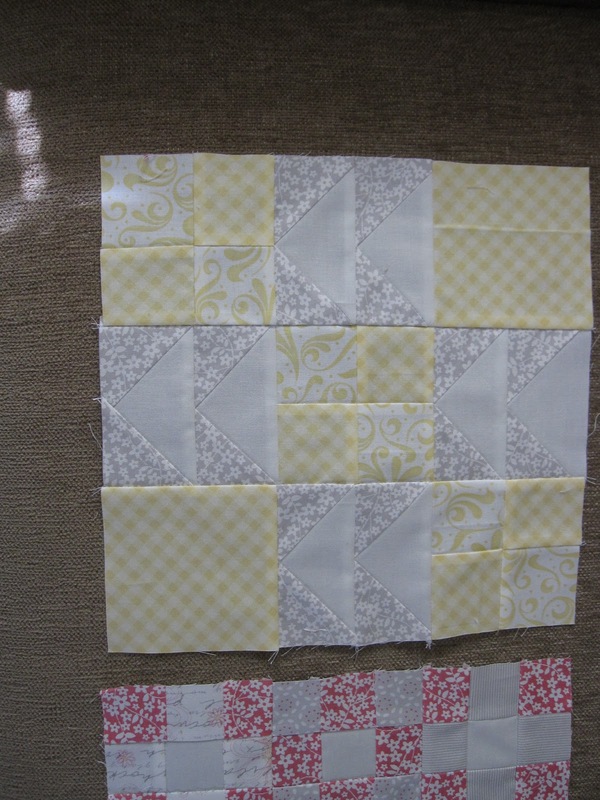 I have almost finished piecing together my School Yard quilt that I am making for a teacher friend of mine. Just need to add some solid sashing all around and need to finding some fabric for the backing. 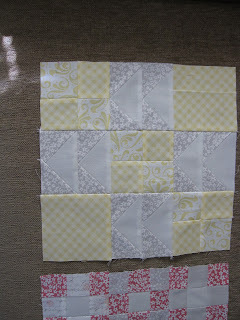 BTW, the pattern is called Square One and it is from Camille Roskelly's Simplify book. I have completed Blocks 1-3 for the Blockapalloza and am working on Block 4. I have decided to skip block 5 as I didn't know when I bought the fabric and began this project that there would be so many flying geese involved and I'll admit right now that I am not a fan. I am looking forward to Block 6 by Happy Zombie tomorrow as she always has super cool ideas. 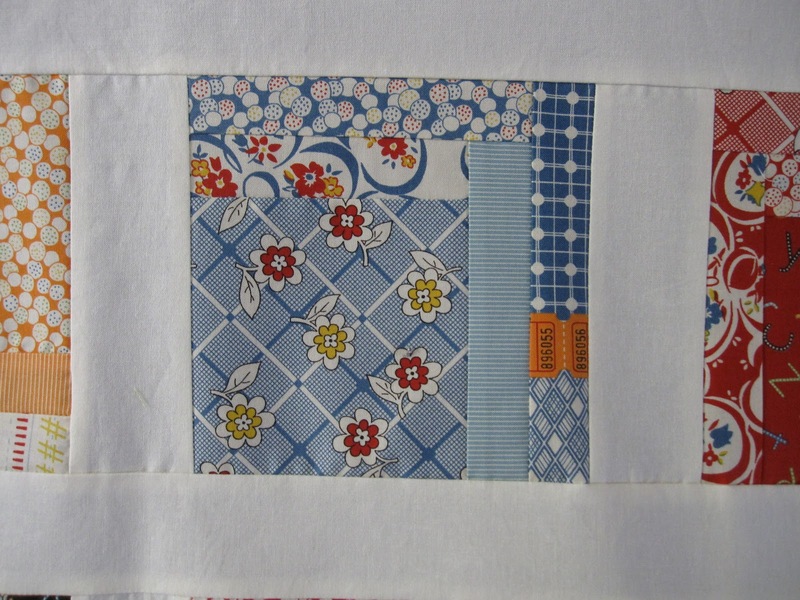 I am working on content for Episode #3 where I will be talking about Quilt Blocks published in Newspapers across the United States in the early twentieth century. I spent about an hour this morning going through the Historical Los Angeles Times and am excited at the wealth of information out there to share with listeners. I have to go read for my Econ class and eat a light lunch as I have learned not to eat a heavy lunch before a 2pm Econ class or I might fall asleep! Check out what others are working on this week with Lee at Freshly Pieced. Hello! You make wonderful quilts! 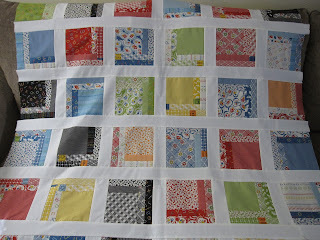 Now I like especially that Sdhool Yard quilt! Beautiful colours and pattern! I love what you are doing with the Punctuation fabric! The color groupings are wonderful. 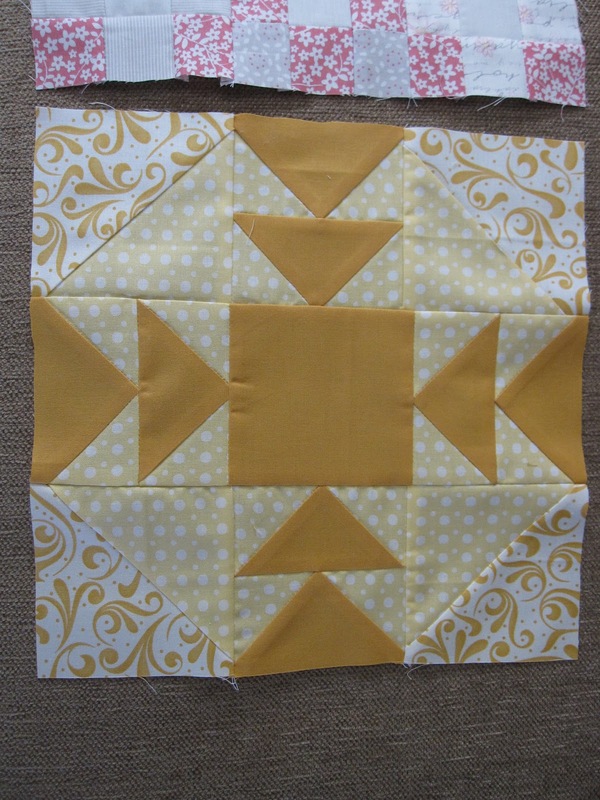 I too am glad I waited to do the blockapalooza quilt. I skipped it because of time constraints, but I am definitely now watching it to see how the quilts shape up before I cut up my fabrics. Susan - looking great! I don't blame you about the flying geese. There are so many. Your school yard quilt is such a treasure. I'm jealous. Want to swap sometime? I completely appreciate handmade :) THANK YOU for the shout-out in episode 2! I finally got on a wi-fi network on my phone to get it. The topic was interesting - I didn't know a thing about quilt shows. I'm looking forward to what you find on the next one! I also have restless leg syndrome, except mine used to happen when I would get into bed. I've been exercising at least 30 minutes every day for the past 5 years (walking the dog) and haven't had any problems with it since! I'm jealous of your cabbage from the garden - mine was devoured by cabbage loopers and promptly went to seed with the warm weather. 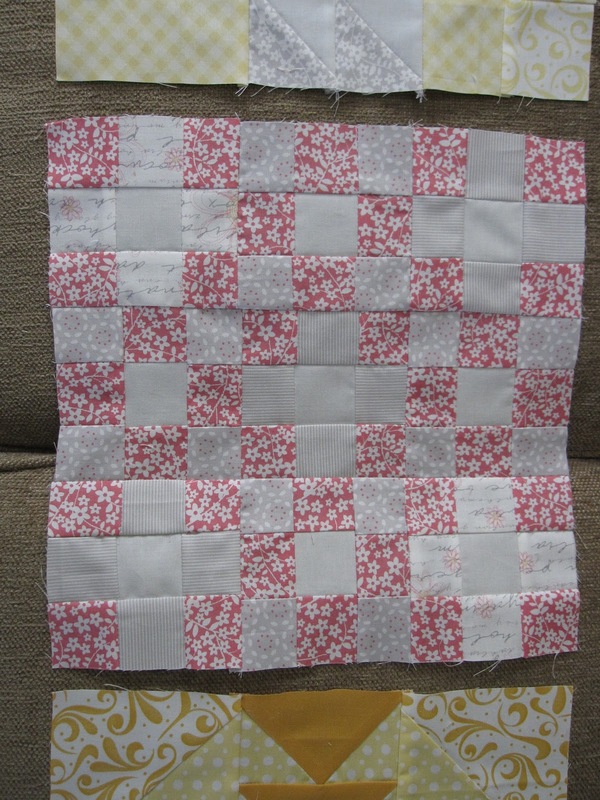 Oooh, I am just LOVING the school yard quilt! So gorgeous. I love the pattern, I might have to pick up that book. Wow! You've been busy! Such nice memories with your dad. We have our first signs of life in the garden here too... garlic sprouts! It's be a while before we can plant, even starts. I'm glad someoen likes kale. We joined a CSA a few years ago when we lived in the deep woods of Michigan, and had lots of kale every week. I tried everything, and just don't like it!!! But I was introduced to chard, and love and grow it now! Where do you host your podcast? 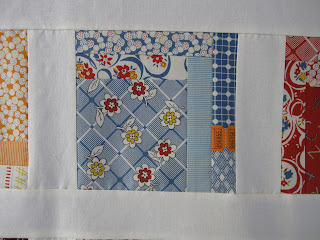 I have been enjoying learning about the history of quilting! Hi Angie - I would have e-mailed you back but you are listed as no-reply so hopefully you will check here for my response. Thank you for your thoughts about my podcast. 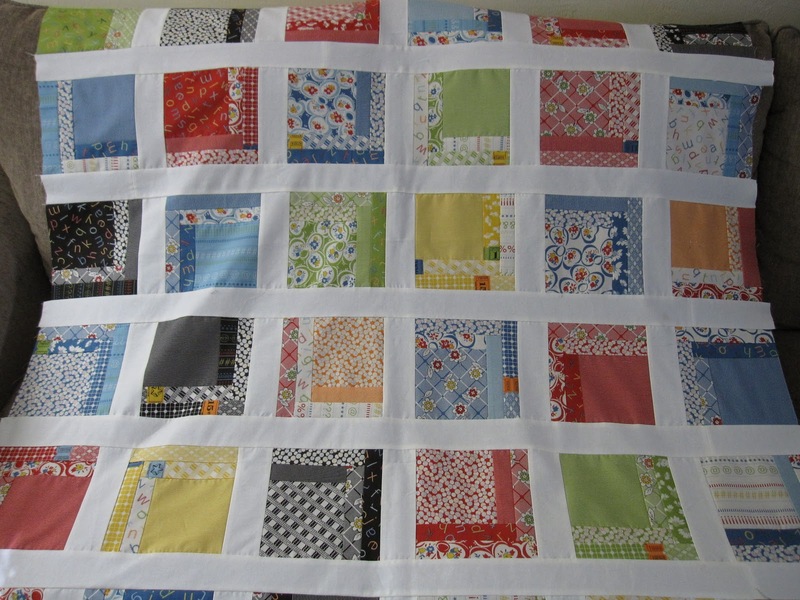 It is up on Podbean and on iTunes - just search for History Quilter and it will pop up. New one tomorrow! Love your podcast also! It is a very good practise for my english!